Microsoft sued the U.S. government on Thursday, arguing that a statute allowing courts to prohibit Microsoft from telling customers when law enforcement comes looking for their data stored online is overly broad and unconstitutional. Microsoft sued the U.S. government Thursday, arguing that a law that can prohibit technology companies from telling customers when law enforcement comes looking for their data is unconstitutional. The lawsuit is the U.S. technology industry’s latest high-profile challenge to the reach of law enforcement into cyberspace, coming a couple of months after Apple fought an FBI order to disable an encryption measure on an iPhone connected to the San Bernardino mass shooting. People and businesses store an increasing amount of their data with Internet services owned by Microsoft, Google, Apple and other companies. Technology companies say that shift has outpaced laws, some decades old, that govern law-enforcement access to electronic communications. The technology industry is vocal about resisting government data demands. That has made the courts a battleground to help decide the balance between the government’s duty to prosecute and prevent crimes, and the privacy rights of individuals and businesses. Microsoft’s case, filed in U.S. District Court in Seattle, challenges a law-enforcement tool the company argues is being used in a way that violates its rights and those of its customers. When law-enforcement agencies get a warrant to grab email or other data stored online, they can request a court order to bar Internet service providers from informing the user their documents were seized. Microsoft said it has received about 5,600 federal demands for consumer data in the past 18 months, almost half accompanied by such gag orders. The lawsuit filed Thursday says the portion of the Electronic Communications Privacy Act that authorizes the gag orders violates Microsoft customers’ Fourth Amendment right to protection from unreasonable searches and seizures. The Redmond company also says the broad application of such orders violates its First Amendment rights to communicate with customers and discuss government behavior. In the physical world, the government typically gives notice of its intentions with a warrant or by appearing to search a desk or cabinet. With the rise of cloud computing, Microsoft contends, the government in many cases has eliminated the notification step by asking an Internet service provider to provide documents under a permanent gag order. The government “has exploited the transition to cloud computing as a means of expanding its power to conduct secret investigations,” Microsoft said in its lawsuit, which names the Justice Department and Attorney General Loretta Lynch. A Justice Department spokeswoman said the government was reviewing the filing. The government has said such secrecy orders can be necessary because subjects could change their behavior if made aware of investigations. The lawsuit is the fourth time Microsoft has taken the federal government to court on privacy or transparency issues since Edward Snowden’s disclosures about data collection by U.S. intelligence agencies. The company is eager to reassure customers, and particularly the businesses Microsoft relies on for most of its sales, which may be worried about unwarranted intrusion into their data. 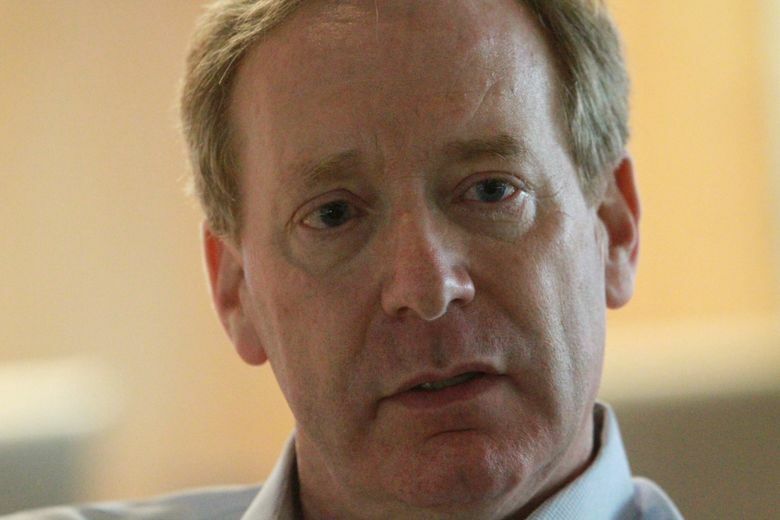 “We hear frequently from our business customers that this is an issue of real importance to them,” Brad Smith, Microsoft’s president and chief legal officer, said of the government secrecy orders. Microsoft and Smith have pushed for better-defined boundaries for the government’s reach, staking out a high-profile stance in favor of protections for data that reflect the principles that applied in a period when most documents were stored in desk drawers and safes. Microsoft is in a yearslong fight with the U.S. Justice Department over the terms of law enforcement’s reach across borders. That case concerns a U.S. prosecutor’s request to seize a Microsoft customer’s data stored abroad. The company’s appeal is awaiting a ruling by the 2nd U.S. Circuit Court of Appeals. That case, as with Apple’s iPhone fight, drew broad support from technology companies and civil-liberties groups. For Smith, a tipping point in the decision to bring the lawsuit came a few months ago, when Microsoft sought to challenge in court a single secrecy order related to a customer’s email. The government responded by arguing Microsoft should be held in contempt and fined for resisting the order. Microsoft ultimately prevailed in that specific argument, Smith said, but it caused the company to take a deeper look at the government’s use of such orders.